On the weekend, Sugar Sammy went far, far east to perform his solo show in Kuala Lumpur, Malaysia. On the surface, it would seem that Sugar Sammy has his signals crossed. The mantra for most comics on this planet is: Go west, young wit. But not Sugar Sammy. Much of the comedy world’s attention may now be focused on Montreal with the 36th edition of Just for Laughs — the largest chuckles gathering in this dimension — kicking off on Wednesday. But Sugar Sammy, once again marching to the beat of his own drummer and compass, has taken his act east. On the weekend, Sugar Sammy went far, far east to perform his solo show in Kuala Lumpur, Malaysia. On Tuesday, he concludes the second of two nights of tapings in Kuala Lumpur for Comedy Central: Stand-Up Asia! Season 3, a 10-part series that will air in 18 Asian countries on Aug. 14. And on Thursday, he lets loose in his one-man show in Singapore. All the above performances are in English. 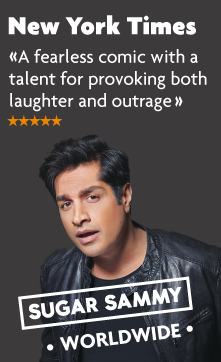 But in August, Sugar Sammy, who can also crack wise in Hindi and Punjabi, will be reverting to the language of Molière when he returns to his current base of operations in Paris for a different kind of gig. He has just been named one of the judges of La France a un incroyable talent, the French equivalent to America’s Got Talent, which draws between 3 million and 4 million viewers a week on the country’s M6 network. Sugar Sammy will be holding the same talent-evaluation position held by Gilbert Rozon until last year. Rozon, the founder and former owner of Juste pour rire/Just for Laughs, had been removed from the show after allegations of sexual assault and harassment against him surfaced last October. “So how’s the traffic in Montreal? It’s a breeze here in Kuala Lumpur, and it’s not much hotter here, either,” Sugar Sammy quips in a phone interview. Unorthodox though his game plan my seem, Sugar Sammy is rather hot as well these days. After wrapping his mega-hit You’re Gonna Rire tour in an outdoor JFL performance here in front of more than 115,000 two years ago, the homegrown comedy provocateur has captured the funny bones of the French in France as well as in Belgium and Switzerland — no matter how much he insults them. In the fall, Sugar Sammy will again resume his run for three months at Paris’s L’Alhambra, where he has been performing during the last year, and he will also be making side excursions to other parts of the franco regions of Europe. “Like the great Wayne Gretzky, go where the puck isn’t,” Sugar Sammy says, by way of explaining his current career path. “Go where everybody else isn’t, particularly most comics. He is able to get a rise out of Asian audiences by comparing their food with that in France. “Malaysian food has flavour and taste and spices and adult-sized portions, while it’s none of the above for the food in France,” he muses. But Sugar Sammy doesn’t fear any reprisals for his audacity to besmirch France’s esteemed culinary reputation when he returns to the country in August to begin shooting on La France a un incroyable talent. The show will air October through December. Sugar Sammy likes to live dangerously. In what will further fire up the French, he wouldn’t mind if Belgium took France in the World Cup semifinal on Tuesday. “That would be sweet revenge for all the times the French have made fun of the Belgians. This is a national nightmare waiting to happen there. I love it. Sugar Sammy will be making a brief stopover in Montreal at the end of July to pay his taxes. But he is planning a major Quebec tour for 2020 or 2021. In the interim, he jokes about penning a play for the 2019 jazz fest here. “It’s called Flav, about the struggle for women’s equality in Quebec … but all the roles will be played by men. No sacred cows in the world of Sugar Sammy.